Benzinga Pro Review - How Good Is This News Streaming Service? Home Trading Software	Benzinga Pro Review – How Good Is This Newsletter Service? Benzinga Pro Review – How Good Is This Newsletter Service? In the world of stock trading speed is of the utmost importance. This means that the fresher the news about the hottest stock commodities, the better. A delay of a few minutes can mean the difference between making hundreds of dollars in profits to losing a lucrative opportunity. What every trader needs is a source that can give them breaking news as it happens, which is exactly what Benzinga Pro is all about. Active traders can get Benzinga Pro and be kept in the loop on a real-time basis. Benzinga Pro is for traders who want exclusive analyses, insider CEO comments and a reliable market news source in one definitive package. The trading news platform was built by Jason Raznick back in 2010 and quickly established itself as the go-to platform for stock traders who want quick access to what’s happening in the financial and trading industry. As mentioned, Benzinga specializes in trading information that can give you an edge. Some noteworthy actionable alerts include takeover rumors, downsizing, upsizing, key points on conference calls, the release of earnings, activist stakes and which company made the biggest market moves, among others. In the world of newswires, Bazinga is considered to be one of the best in news alert services. Furthermore, there are added features such as audio alerts and customizable trade alerts. While Benzinga Pro is often compared alongside news platform giants such as Bloomberg, CNBC and Wall Street Journal, it has a few key differences of its own. Benzinga was created solely to benefit traders and their search for the next big stock. Simply put, it’s the news platform of choice for traders who absolutely need the right kind of trade information ASAP. Benzinga Pro sports a web-based engine that can be accessed anytime using either a Mac or a Windows device, i.e., a laptop, a tablet or a smartphone. This makes Benzinga Pro more accessible than its competition while still providing a wealth of features for its users. Almost all of Benzinga’s features are related to helping you make better trades. Some of the notable examples include Market Commentaries, Trading Ideas, Economic & Earning Calendars, Sentiment Indicators, and Watchlists. Real Time Newsfeed Access – Benzinga Pro users can get previews and expert analysis on upcoming financial events. The news alert service platform has retained its reputation for providing breaking news faster than mainstream financial news outlets. The feed streams real time and has helpful color stickers to indicate whether the price is going up (in green) or going down (in red). Full Calendar Suite – Subscribers get full calendar access to market movements and announcements that you can use for trading purposes. The suite is sub-divided into helpful categories regarding economic announcements, i.e., retail sales, current IPOs, splits, news, acquisitions, mergers, rating shifts, conference calls, etc. Watchlists and Customizations – You can choose to concentrate on certain feed categories for a more focused trading. You can create your own watchlists made up of different newsfeeds for different categories, i.e., by time frame, price range, sector, etc. Search Engine – Here, you can do a quick query on essential information such as a stock’s earnings, ratings, the most recent news about them and other data that could help you make a successful trade. Original Market Commentary – Subscribers get full access to all of Benzinga Pro’s articles made by expert analysts, including a commentary on ratings and earning previews. Trading Ideas – In this section of Benzinga Pro, you can view trade ideas with a panel of expert stock analysts following recent financial news reports. 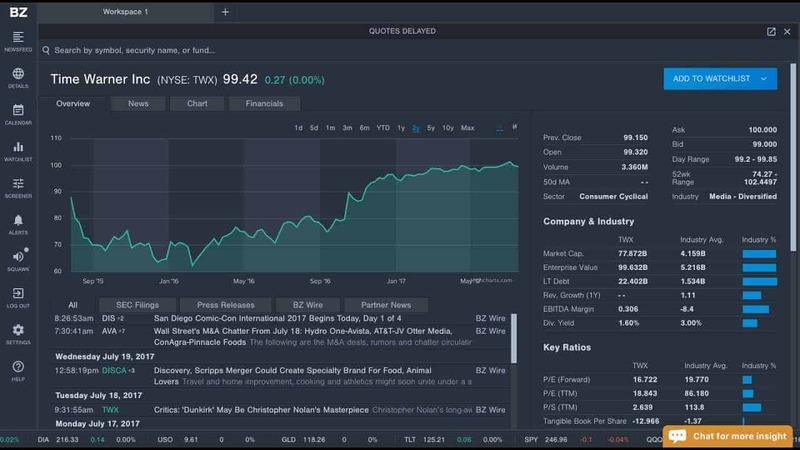 Sentiment Indicators – Benzinga Pro analysts utilize historical data in light of breaking news to give you expert insight on the extent and probable direction of stock movement. The Newsdesk Chat feature is one of the most helpful tools you can get when you sign up on Benzinga Pro. It’s like having your own personal team of expert stock analysts you can rely on when you want to get opinions regarding stock movements. Having access to the Newsdesk Chat can certainly come in handy, as you get to the hows and the whys regarding financial news and stocks, which can help you decide whether to invest or pass up on a trade option. The feature connects you straight to a Newsdesk professional (if you’re a Premium Member) or to a chat support agent and gain knowledge on why stock X has grown so much overnight, and why stock Y has fallen. The answer that you get won’t be based on speculation but rather solid facts as these analysts will check with industry sources to get more information, check for breaking news regarding a specific company or stock and read the stock charts for any discernable pattern. The Audio Squawk alert is one of the things that separate Benzinga Pro from other competitors. It’s like having a dedicated radio station feeding you important stock news via audio 24/7. In short, you get a minute-by-minute audio update as long as you’re connected online. When your eyes are focused on price actions and market trends, your ears can process company announcements and major news pieces even before it hits the wire and gets broadcast on major feed channels. Upgrading this service to a Mach III is definitely worth it as you may miss out on certain announcements because you were looking at market shares or comparing stock prices. Many Benzinga Pro subscribers swear by the audio alert feature as a tool that brought them huge profits. Some shared that they turned up the speakers and were still connected to the stock world even when they took a coffee break, ate lunch, showered, etc. You get the news before it’s uploaded to the world wide web! Some of the audio alerts cover the following news information- key commentaries from interviews, press conferences, trade chatter and market rumors, critical breaking news, company management reports, economic data releases, conference calls, earning beats and misses, high volume of trading in stock and options, tradable ratings, profitable rumors and much more. 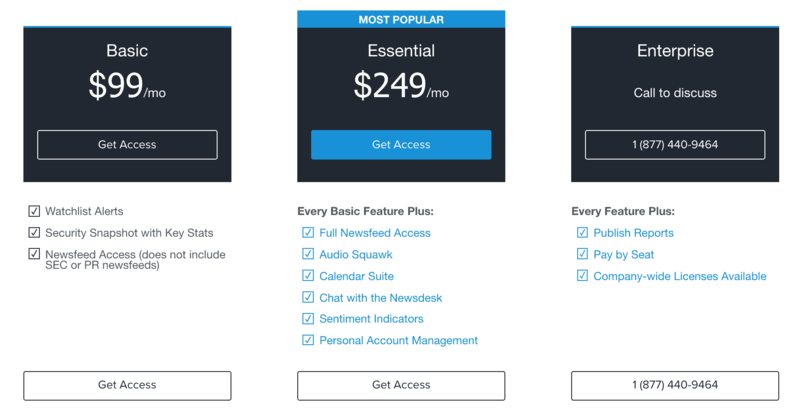 Benzinga Pro has 3 membership levels, with the Enterprise Package being the most expensive and having the most features. The Basic Service unlocks Watchlist Alerts, access to News Feeds and the Security Snapshot. It’s worthy to note that the news feeds don’t cover PR and SEC reports and the game-breaking Audio Squawk, which could pose as an incentive for the user to upgrade to a higher membership level. You do get real-time access to relevant stock news feeds at a lower cost than other financial news feed sites, which by itself is already worth the price of entry. Then comes the Essential Package at $249 per month. This membership level includes the Basic Feature Plus and all the extra bells and whistles, including the Audio Squawk, the Calendar Suite, the Newsdesk Chat, Personal Account Management and Sentiment Indicators. You can be sure that each dollar is worth it as you get the full menagerie of tools and trading information at the palm of your hand. You won’t have to fly in blind and risk your money on trade options because you didn’t get the latest news. By the way, both Basic and Essential Packages are heavily discounted if you choose to pay for the membership for one whole year. The pricing is fair and can be recouped quickly due to having real-time knowledge of stocks and trades. You can also opt for a monthly plan and go from there. The third membership level is called the Enterprise Package, and in order to get this, you’ll need to call Benzinga’s phone number to learn more. On the website, it states that you get all Features, plus Publish Reports in a Pay By Seat format. Intuitive Dashboard – Benzinga Pro’s interface isn’t overwhelming. In fact, it’s been designed to gently ease the user in while providing all the essential information within the dashboard. Navigation is dead simple and you can get to where you need to go in a couple of mouse clicks. The minimalistic interface will be sure to make you more efficient and act faster than before. Real-time Speed – Benzinga is undisputed when it comes to the delivery of news on a real-time basis. Financial Research Platform – One of the dashboard’s main feature is the Financial Research Platform. Here, you can quickly look at essential data such as activist stakes, takeover bids, rating changes according to pro analysts, company earnings, etc. Customized Alerts and Watchlists – Create your own portfolio of Watchlists for a streamlined trading process. You can also customize alert notifications according to several parameters. Audio Squawk – One of the most distinctive features that separate Benzinga from the rest. Get news instantly via an audio format before it gets published on the web or announced on major news feed stations. Desktop Notifications – This can prove to be handy if you’re always on the move. Get desktop notifications sent straight to a compatible device. Email Alerts – Get the latest company announcements and SEC filings straight to your preferred email inbox. Ads – Benzinga gains revenue on the side from advertising. Expect to see ads in your inbox and on-site after signing up. Pricing – Membership fees are not cheap, but you can save up on costs by getting the annual billing. Benzinga Pro is great at what it does, which is providing traders with real-time knowledge that could help them make a profit. It’s easy enough for beginners to jump right in and robust enough for pro traders to find Benzinga their new favorite news feed service for all things trading.